During Programme No. 14 from 7 until 29 August, 2010, exhibition “Back Flow” by the Dutch artist Aldo Kroese (1976) will be open to the public at the kim? / RIXC gallery. The exhibition will showcase six sculptures and a video created especially for “Back Flow” at Kim? and takes place with the support of airBaltic. In his work, Aldo Kroese is looking for answers to questions like: how to visualize the transition between two stages or a movement from A to B. In other words, he shows a process. Elements like time and motion are important factors in these questions. In 2008, Kroese started to research the subject of water. Being Dutch, he is confronted with water every day. With a large part of the country being under sea level, the people in Holland have a great history when it comes to fighting the threat of water. Nowadays they have learnt to live with water. During an Artist-In-Residence in Nicosia, Cyprus in 2008-2009, Kroese focussed on the differences between his wet country and the dry island in the Mediterranean Sea. Holland is threatened by vast amounts of water from the rivers, the rising sea level and an increasing rainfall. Cyprus, on the other hand, is suffering from its absence. The “water problem” as we know it today, is a fundamental, global theme. Subject to many projects and research on environmental, political and social levels. Many refer to water as the blue gold and predict it to become the subject of major global conflicts. Aldo’s view point, as an artist, is that of an observer. 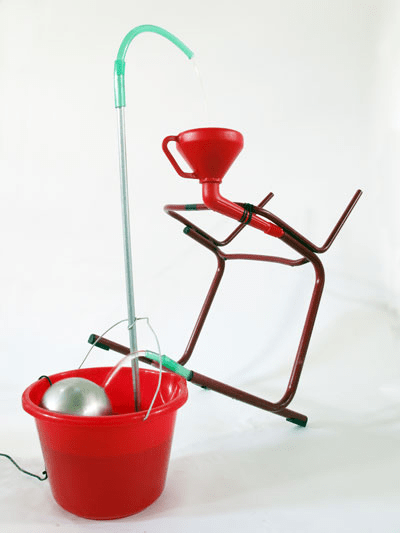 He approaches the subject from a poetic, human viewpoint and experiments with the different qualities of water in a playful way, creating sculptures in which he uses water both as a medium and a subject matter. The title of the exhibition refers to a term used in the hydro-physics of potable water and is close connected to the principle of siphoning. Where water has a natural tendency to flow to the lowest possible point, siphoning makes it flow up first, in order to flow down later. Backflow, also called back siphoning, is the flow of water into the distributing pipes of a potable supply of water from any other than its intended source. Making use of a pump to get water to a certain level, the backflow is an autonomous, silent process. Aldo shows us the poetic side of our daily commodity. It proves to be both an inspiring subject and a good medium to work with. The different qualities hold opposites like full and empty, wet and dry, high and low or floating versus sinking. Disconnecting it from a specific place, he experiments with the different qualities and creates works in which he uses water both as a medium and a subject matter, entwining them with everyday objects. Emphasizing the cyclic nature of water, the kinetic sculptures move in a continuous loop. Aldo Kroese works in media of photography, video and sculpture. He also teaches at the Gerrit Rietveld Academy in Amsterdam. The artist has been participating in exhibitions since 2005 and his works have been exhibited in various exhibitions and as a part of different projects in The Netherlands, Cyprus and Germany. Since 2006, Aldo Kroese’s works have also been published in different media. The exhibition takes place with the support of Stroom Den Haag, The Netherlands.